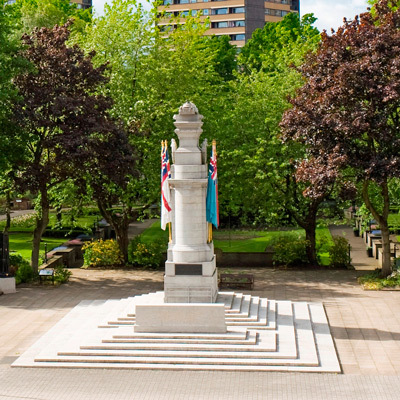 A PERMANENT memorial will be unveiled in Rochdale this summer to honour the service of local men who fought in one of the bloodiest campaigns of the First World War and the sacrifices made by their relatives at home. Rochdale Borough Council has confirmed that the memorial stone (pictured below) to mark the centenary of the Gallipoli campaign which resulted in the deaths of hundreds of local soldiers will be unveiled in Rochdale Memorial Gardens during a special Gallipoli commemoration event on Sunday 28 June. The event, which will also include a military parade in the town centre, will be part of the borough’s national Armed Forces Day celebrations. Preparations for the afternoon, which will feature the Kings Division Band, are well underway. Back in August 1914, 1,000 soldiers from the 6th Battalion of Lancashire Fusiliers gathered in Rochdale before being sent to Egypt and on to the killing fields of Turkey. Few came home alive or unscathed. Those who enlisted were remembered last summer with the recreation of a march made by more than 1,000 soldiers from the 6th Battalion of the Lancashire Fusiliers. Councillor Alan McCarthy, lead member for the Armed Forces at Rochdale Borough Council, said: “The Gallipoli Campaign saw considerable losses for Britain and her allies. It is right that we commemorate those local men who fought and died and remember their sacrifices. Rochdale was also one of the first councils in the country to sign the Armed Forces Community Covenant in November 2012. The Covenant is aimed at encouraging local communities to support services that promote and encourage activities that help integrate Armed Forces personnel back into civilian life. It also encourages authorities to work more closely to support those in service and their families, ensuring there is no disadvantage associated with serving in the Armed Forces.